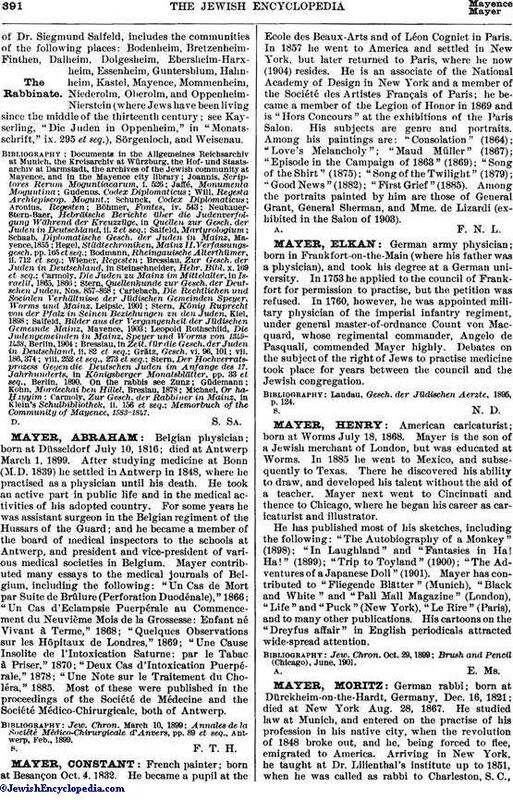 German rabbi; born at Dürckheim-on-the-Hardt, Germany, Dec. 16, 1821; died at New York Aug. 28, 1867. He studied law at Munich, and entered on the practise of his profession in his native city, when the revolution of 1848 broke out, and he, being forced to flee, emigrated to America. Arriving in New York, he taught at Dr. Lilienthal's institute up to 1851, when he was called as rabbi to Charleston, S. C.,where he remained until 1856. Failing health and differences with his congregation owing to his radical views compelled him to leave Charleston; and he returned to New York, intending to practise law. For a short time he officiated as rabbi in Albany, and then, again returning to New York, he became secretary of the Grand Lodge of the Independent Order B'nai B'rith (1863), which office he held until his death. 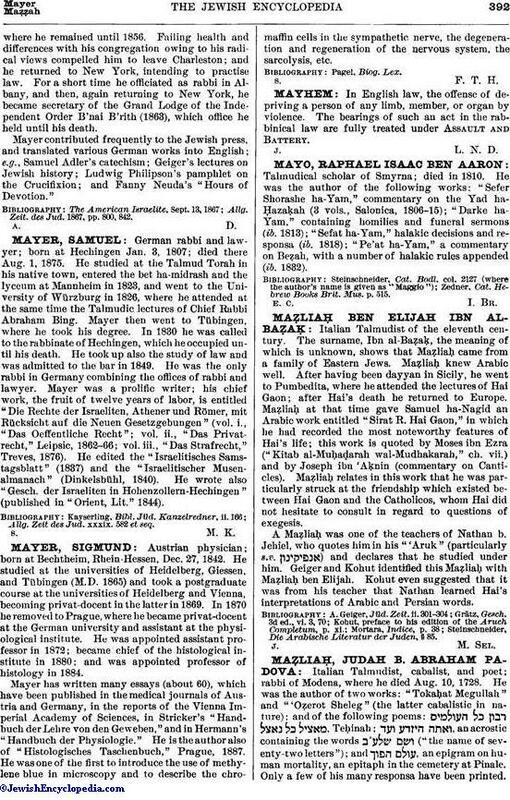 Mayer contributed frequently to the Jewish press, and translated various German works into English; e.g., Samuel Adler's catechism; Geiger's lectures on Jewish history; Ludwig Philipson's pamphlet on the Crucifixion; and Fanny Neuda's "Hours of Devotion." Allg. Zeit. des Jud. 1867, pp. 800, 842.